622 press was born on June 22, 2008 when I drove to Hartford, WI to purchase an 1882 Pearl Oldstyle from a very nice electrician who had acquired it a year earlier—and named her Bess (the press! Get it?). Reportedly, she had sat idle in an elderly couple’s basement for over 50 years and they were just happy to have someone to move it. After several weeks of cleaning, organizing and ordering supplies, 622 press had its first printing in late July. For more about how I got my studio up and running, see this post. My love for handmade goods, however, started much, much earlier. It could have been the Christmas I received the pink sewing machine or the omni-presence of construction paper in my parents’ house, but it has only increased since then. Fast forward to the present and I’d been pursuing letterpress as a weekend and evening hobby/business for more than six years. I have greeting cards and limited edition prints in a handful of stores across the country and have printed business cards, invitations and other custom work for countless clients. Just over two years ago, I decided it was time to shake things up. I took a leap of faith and went full time with my business which also enabled me to move in with my boyfriend—in Bermuda (more about that here and here). 622 press has been growing and it’s been quite an adventure. 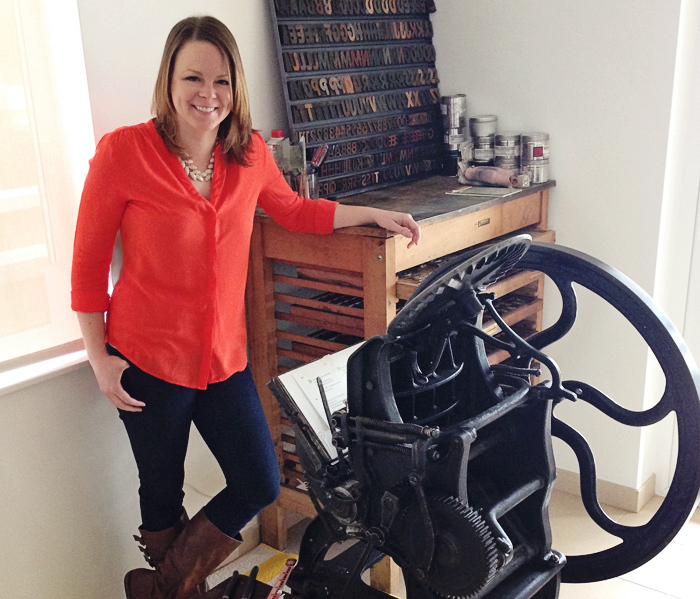 I’d love to work together on a design or custom letterpress project—just get in touch at six22press@yahoo.com. Can’t wait to hear from you! Wow! I stumbled here with Peace Symbol gift ideas on my mind. My eleven year old wants everything Peace this year … it’s happening through her middle school here in Des Moines. Maybe, just maybe you might think of something special?! I love your blog, really nice rings on your wish list! Also looking for business cards. I look forward to hearing from you! wow, cant believe its 15 years! oh and thank you, great work! Hi 622press. Thank you for the nomination, belatedly! A link back to you is here: http://peachfarmstudio.wordpress.com/2012/01/12/thank-you-you/ Cheers and happy blogging! I love your story and your work! Thanks for your kind words on my blog. Be well! I am not seeing a way to follow your blog. I see a Pinterest link but that’s it.